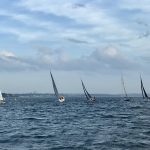 Thirteen boats showed up for the JAM season finale on Sunday, August 26. A solid breeze was the perfect season ending. Results are below. We hope to see you all at the Sayers Series coming up in mid-September. A special thanks to Gypsy Wind for being committee boat.